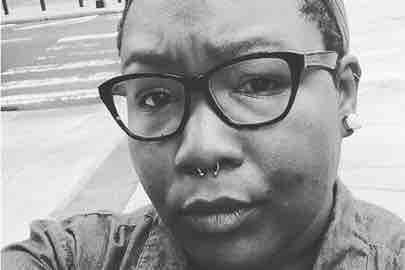 Fundraiser by Lenée A. Voss : Help a sista out! First: thanks for taking the time to read this. I'm Lenée. I'm launching this campaign to keep me afloat in a time of unexpected hardship. Since spring 2016, I have experienced extremely painful, debilitating menstrual periods. What was once typical pain devolved into body racking pain and an inability to eat or sit up for more than a few hours at a time. In January 2018, I received a preliminary diagnosis of multiple submucosal fibroid tumors in my uterus. Though fibroid tumors are non-cancerous, they can cause a great deal of pain to those who have them. After imaging to confirm the initial diagnosis, I was scheduled for and had surgery to remove the tumors in April of this year. I was relieved to have the procedure, in hopes that my quality of life would improve, as I had come to the point of missing 3-5 days of work every single month. I anticipated never again missing work because of the pain and associated struggles of a menstrual period that was completely out of control. Three days after surgery, I developed a severe upper respiratory infection that kept me out of work a week longer than planned. Because I work two part-time jobs, I do not have paid time off. I pulled from my savings to cover additional expenses and returned to work as soon as I was able to do so. Two weeks after my surgery, I found myself in worse pain than I had ever experienced. I took myself to the emergency room, where I learned that there was an additional, subserosal fibroid tumor that had not been removed. A subserosal fibroid tumor exists in the uterine wall and extends into the pelvic cavity. For perspective: if you make a fist and are wearing a ring, the tumor is the ring. It's on the *outside*, and presses against the other organs in the pelvis. This explained the pain I've had since 2016! I was relieved to learn what was going on wasn't life-threatening, but deeply upset that my gynecologist and the imaging team at the hospital failed to inform me of what was going on. At no point was I told by my doctor or the imaging team that there was a tumor on the outside of my uterus. After my emergency room stay, I fell into a massive depressive episode, including dissociation and self-harm ideation. Six weeks post surgery, I have been to the emergency room a second time because of the incredible pain I've been in. I'm still suffering debilitating menstrual periods, despite having had surgery to rectify the situation. Throughout, community members, friends, and family have helped me as best they were able. I'm in need of more. - I worked about half of my scheduled working days in April, and have missed some days in May. - I used my small savings to cover May's rent and am behind on my phone, gas, and electric bills. - My depression (I live with Bipolar 1) and anxiety have been next level terrible; realizing that I need help has made me feel worse. I have not been able to work on any of the projects I’ve wanted to, nor have I been able to focus properly on the jobs I have. - I have an immediate need to cover groceries, past due utilities and phone, transportation, and my internet bill so I can work. - While I am exploring my options to rectify the medical neglect of my doctor, this process is long, arduous, and taxing. I need help *now*, and cannot wait for a possible settlement in a process that could potentially take years. I wouldn’t ask if I were not in legitimate need. The money I’m asking for will cover my immediate needs and create a small cushion so I can breathe. I opened up GFM to post an update and saw that I’ve exceeded my most recent goal. I don’t have the words to articulate how grateful and shocked I am. Thank you all! The planned update: I’m having surgery in late June and want to stretch my goal according to those expenses, with an itemized list to come. Stay tuned! It’s been two months since my last update (time has both flown and dragged). I’d like to share as succinctly as possible what’s going on. Despite the success of my November procedure, I do eventually have to have a hysterectomy. The damage done to my uterus during last April’s procedure led to a number of complications for me. These complications included engorged Fallopian tubes (which had to be removed) and scar tissue along my uterine wall that make menstruation extremely painful and dangerous. My doctor started me on a hormone treatment to stop me from ovulating, as my ovaries are perfectly healthy. So far, the hormone treatment is working and I have been consistently pain free for three of the last four weeks! With this stabilization of my body, I’m able to seek and do work. As it’s been about ten months since I launched this campaign, I am eager to close it and move on, and eventually find a new normal for myself. Your help has been consistently valuable throughout this time. I’m super grateful. A brief update: I have not yet found a job. I have, fortunately, been able to find some short term contract work that begins at the end of January. In the meantime, I still need support. My treatment plan seems to be working, but I do have to have another surgery eventually. My doctor and I are figuring out when that happens. I’m looking for an attorney who believes that I have a case. More on that at another time. A quick update: I got the pathology report from my surgery: all removed tissue is benign! My doctor and I have come up with a temporary treatment plan, as the botched surgery in April 2018 caused irreparable damage to my uterus. The most important thing I can do right now is stabilize myself by finding a new job and building a routine that supports my continued healing. I have updated my goal amount to reflect my current and upcoming financial needs. I’m very grateful to everyone who’s shared and given — I would not be here without your support. Thank you.